I am looking forward to engaging with the readership in discussion on articles contained in our most recent edition of CJSM that came out on May 8. If you haven’t had the chance to check that issue out, please do so. The focus in this edition is on “Injury Surveillance in Sports Medicine.” We have a lineup of articles highlighting research on this issue in an array of sports, ranging from snowboarding to ice hockey to baseball, and from high school to Olympic levels of sport. I plan to post thoughts about a couple of articles I find particularly interesting, so make sure to visit this site and the CJSM journal site over the next week. But first, my interest was piqued last week by an article in a Lippincott Williams & Wilkins sister journal, the Journal of Pediatric Orthopaedics, and I wanted to write about that on this Sunday morning, Mother’s Day here in the U.S. (“Mom” has already had her breakfast in bed and is off for a massage, the kids are outside playing, and so I’ve got a couple of hours to get on-line). My topic for the day is the article, “Imaging Modalities for Low Back Pain in Children: A Review of Spondylolysis and Undiagnosed Mechanical Back Pain,” found in the April/May 2013 issue of the Journal of Pediatric Orthopaedics. We see a ton of visits for back pain in our clinic at the Nationwide Children’s Hospital Division of Sports Medicine in Columbus, Ohio. Our Department of Orthopaedics does as well, but I can only speak directly to the experience of our Division of Sports Medicine, where nine primary care sports medicine physicians (including our fellow) do full time sports medicine. In 2012 we saw 548 unique, new back pain visits in the Division, with a median age on presentation of 14.2 years and a gender breakdown of 55% female visits to 45% male. Back pain represents 9.2% of our Division’s total new patient visits and is the third most common ‘body part’ we see on presentation (knee is number one, ‘head’–mostly concussion–is number two) with approximately 1700 of 13,000 total patient visits in 2012 having their principal diagnosis fall in some diagnostic category of back pain. This is hardly surprising, as the literature is full of reports showing the rather high prevalence of back pain in pediatric and adolescent populations. Despite the persistent notion that kids don’t get back pain, studies of youth have shown prevalence rates of 20 per cent of “at least weekly back pain”; by 18, the rates of low back pain in youth approach those documented in adults. There is a curvilinear relationship between physical activity and incidence of low back pain in adolescents, with both low and high physical activity levels associated with a higher risk of back pain. Though the literature is mixed on the issue, the consensus overall as I understand it is that participation in sports has been identified as a risk factor for the onset of back pain in pediatric and adolescent populations, with sports such as wrestling, American football, gymnastics, and, yes, surfing having relatively high rates of back pain. The principal etiology for that back pain in youth is spondylolyis/listhesis (in the remainder of this post, I will often shorten that to ‘spondy,’ to spare my wrist and hand repetitive motion injury). I don’t have my hands directly on our Division’s spondy data this morning, but the last I looked the numbers were similar to what I have seen reported in the literature in the past. A study with which I am familiar, authored by Micheli and Wood in the Archives of Pediatric and Adolescent medicine, reported an prevalence of spondylolysis of 47% in their cohort study, which was conducted at the clinics of the Division of Sports Medicine, Children’s Hospital, Boston. Discogenic back pain was found 11% of the time in this population, and ‘low back sprain’ or ‘hyperlordotic mechanical back pain,’ two diagnoses whose ‘pain generators’ may not be appreciated on imaging, together comprised the remaining 32%. So, when I picked up the study in the Journal of Pediatric Orthopaedics, authored by Miller, Beck, Sampson et al. from Children’s Hospital of Philadelphia (CHOP), I was surprised to see the numbers they were reporting. The study group conducted a retrospective review of patients aged 10 to 19 who presented to CHOP with complaints of back pain. They included healthy adolescent patients with a history of low back pain and a documented radiographic study of the lumbar spine at the initial visit. The study authors note their further inclusion and exclusion criteria, though they do not specifically or explicitly say whether they included or excluded patients with disc pathology or spinous process apophysites, two not uncommon etiologies of low back pain in this population. After chart review, including looking at radiology reports (the authors did not look at the images themselves) for any of the individuals who had imaging, they classified patients as having a final diagnosis of either a spondy or “undiagnosed mechanical low back pain” (UMLBP). The CHOP group ultimately reported a total of 2159 (76% of their patients) had UMLBP and only 194 (7.8%) had a spondy. This is the single most significant piece of data reported in the article, as far I was concerned, because it is so radically different from the spondy prevalence figures with which I am familiar, as I have written above. The authors spend a good deal of time as well discussing issues of imaging and radiation safety, which I will discuss soon in a future blog post, but I would like to address my concerns with these reported incidence numbers first. I am a real believer in Evidence-based medicine, and so if these numbers stand up to critique and repeat analysis, I think this study stands a chance to significantly influence how we clinicians may need to address the issue of low back pain in pediatric and adolescent populations. I am, to repeat, operating in my clinic on the premise that nearly 50% of my new low back pain patients may be harboring a spondy; that figure I draw from the Micheli study, conducted in a population (adolescent athlete) seen at a clinic resembling the one in which I practice (a Sports Medicine referral center at a large pediatric hospital). This new CHOP study suggests the figure for the incidence of a new spondy in a patient walking into my clinic may be closer to 8%. That difference is huge. My initial reaction is that I am having trouble accepting these figures, and I wonder about the study’s potential limitations. The study authors note two significant ones–the retrospective nature of the study, and their reliance on radiology reports as opposed to reviewing the images themselves–but I think there are several more limitations that may concern me. First, there is no attempt to understand a ‘loss to follow up.’ That is, what might one make of the patients (the number is arguable, but I would estimate not insignificant) who had presented to CHOP; may have had negative imaging; were told they had UMLBP; and subsequently sought second opinion or were seen elsewhere where further imaging may have demonstrated a spondy? 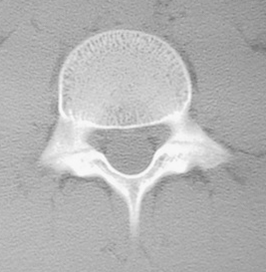 Second, the study authors recognize that plain films can be insensitive in the evaluation of a potential spondy, and note concerns about radiation safety that may stay their hand in considering ordering a SPECT scan; but their case definition of UMLBP would certainly include patients who may have a spondy on a SPECT that simply hasn’t been ordered. The absence of diagnostic imaging potentially confirming an occult spondy is something of a self-fulfilling prophecy for the diagnosis of UMLBP, I would argue. Third, I am not sure how generalizable the findings are to my patient population: I wonder how many of the CHOP patients were athletes. Getting to the bottom of what is causing back pain–finding the ‘pain generator’–these are issues with some time urgency for many of the patients and families we treat. Most readers will be aware of the classic history and physical for a suspected spondy, so I won’t belabor the point. To review, a clinician is typically looking for a history of subacute extension-based pain. A classic physical exam maneuver is a Stork test, but, of course, there are significant clinimetric limitations to this test: a study in the 2006 British Journal of Sports Medicine found that the sensitivity and specificity of the test for detecting a spondy were approximately 50% each, with a positive and negative predictive value no better than 53% and 46% respectively. Pretty weak numbers. So, I would say that most of the practitioners I know in this field, will, depending on the patient’s history–their sport, their specific triggers for pain, how long they have experienced pain–will order 2 view (standing lateral and AP) lumbar spine or 4 view (additionally a left and right oblique view) plain films. Whether to order a 2 view or 4 view is a controversy in and of itself (next blog post); regardless, the sensitivity of plain radiography is rather low, and often times a clinician will follow up a negative plain film with an MRI, CT scan or SPECT scan to confirm, or rule out, the diagnosis. Whether to order these studies and pursue the diagnosis aggressively would be hugely influenced by the understood prevalence of the problem at hand, spondylolyis/listhesis, in the population being treated. Would it make sense to subject a patient to the expense and potential radiation in the case of CT scans, SPECT scans, and even plain films if the prevalence of a spondy was as low as 7.8%? The CHOP authors eventually argue the answer is, no. Which brings us to the threshold of the second part of the CHOP study: an evaluation of the radiation dosages and concomitant safety concerns in the work-up of a potential spondy. More on that in the next blog post. In the mean time, please consider responding to this blog post and joining in the conversation. What did you think of the CHOP study (go read it!)? What is your experience with spondys? What is your reading of the literature? What is your understanding of the prevalence of spondys in the adolescent athletic population? We’d love to hear from you!